Commonly thought to be older than it actually is due to its Gothic stylings (although, to be fair, parts of it do date from medieval times), the Palace of Westminster – or, as it’s more commonly known, the Houses of Parliament – didn’t actually take on much of its current appearance until the latter half of the 19th century. The need for a new building for parliament arose after 1834 when a fire, caused by the overheating of two underfloor stoves used to incinerate the Exchequer’s obsolete tally sticks, tore through the former complex, leaving only some structures from the old palace intact. They included the 11th century Westminster Hall (the largest in Europe when it was built), 14th century Jewel Tower and a chapterhouse, crypt and cloisters, all of which was once attached to the now gone St Stephen’s Chapel. While King William IV offered the use of Buckingham Palace for Parliament, the idea – along with a host of other options – was rejected as unsuitable. Instead, a competition was held for a new design and after almost 100 entries were considered, architect Charles Barry and his design for a new palace in the perpendicular Gothic style was chosen. Interestingly, while Barry was a classical architect, under the terms of the competition, designs were required to be in a Gothic style, thought to embody conservative values . Incorporating some of the remains of the old palace – including Westminster Hall but not the Jewel Tower which to this day stands alone – the design was based around a series of internal courtyards with the House of Commons and House of Lords located on either side of a central lobby (first known as Octagonal Hall). The design involved reclaiming some land from the Thames so the building’s main river-facing facade could be completed. Towers stand at either end of the complex – the Victoria Tower over the Sovereign’s Entrance at the southern end of the complex (for many years the tallest square stone tower in the world) and the narrower tower formerly known as the Clock Tower which houses the bell Big Ben, at the northern end – and there is a central Octagonal Tower which stands directly over the Central Lobby. The Clock Tower, incidentally, was renamed the Elizabeth Tower last year in honour of Queen Elizabeth II’s Diamond Jubilee (for more on it and Big Ben, see our earlier entries here and here). Other towers include the Speaker’s Tower (located at the northern end of the building on the waterfront, this contains a residence for the Speaker), the Chancellor’s Tower (located at the southern end, it too contained a residence originally used by the Lord Chancellor) and St Stephen’s Tower – located in the middle of the building’s west front, it contains the public entrance to the building. Significant other rooms in the palace complex include the Robing Room – where the Queen puts on her ceremonial robes and crown before the State Opening of Parliament – and the Royal Gallery, used for state occasions. The foundation stone (the building was constructed out of sand-coloured limestone from Yorkshire) was laid in 1840 and construction of the monumental building – which features more than 1,100 rooms and two miles of passageways – wasn’t completely finished until the 1870s although most of the work had been completed by 1860 (the year Barry died). The House of Lords first sat in their new chamber in 1847 and the House of Commons in 1852 (it was at this point that Barry was knighted for his work). The cost, meanwhile, originally estimated at less than £750,000, ended up coming in at more than £2 million. Much of the interior decoration owes its appearance to the Gothic revivalist Augustus Pugin who designed everything from wallpapers, to floor tiles and furnishings. Pugin also helped Barry with the external appearance but like Barry died before the project was completely finished (in 1852). The palace was bombed numerous times in World War II – in one raid, the Commons Chamber was destroyed as firefighters opted to save the much older Westminster Hall instead. It was later rebuilt under the direction of Sir Giles Gilbert Scott and completed by 1950. Other aspects of the building have also been restored. 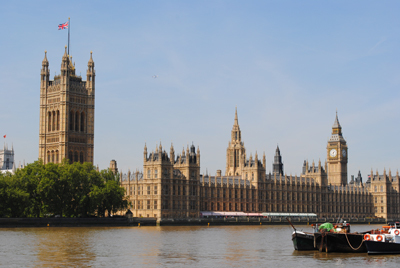 A Grade I-listed building classified as a World Heritage Site, Barry’s Houses of Parliament remain one of London’s most iconic structures. We’ll be looking in more detail at some of the building’s features in future posts. WHERE: Houses of Parliament (nearest Tube stations are Westminster, St James’s Park and Embankment); WHEN: Tours (75 minutes) are run from 9.15am to 4.30pm on Saturdays (also six days a week during summer opening); COST: £15 adults/£10 concessions/£6 children five to 15 years (children under five are free). Prices go up after 1st April – check website for details and to purchase tickets (tours for UK residents, including climbing the Elizabeth Tower, can also be arranged through your MP); WEBSITE: www.parliament.uk. For more, see Robert Wilson’s guide to the The Houses of Parliament or David Cannadine’s indepth, The Houses of Parliament: History, Art, Architecture . For more on the story of the fire in 1834, see head parliamentary archivist Caroline Shenton’s recent book The Day Parliament Burned Down .